Tucson’s Trevor Werbylo and Ashely Menne of Surprise notched wins in the Boys and Girls Championship Divisions at the Tucson City Junior Championship, held at Dell Urich Golf Course and Randolph North Golf Course May 26-27. Werbylo finished strong at seven-under par for the tournament, carding a five-under-par 65 in the final round to win by three strokes (72-65—137) over Tucson’s Tylor Blohm who turned in a steady 70-70—140 performance. Matthew Schwab of Chandler finished in third place (71-70—141). 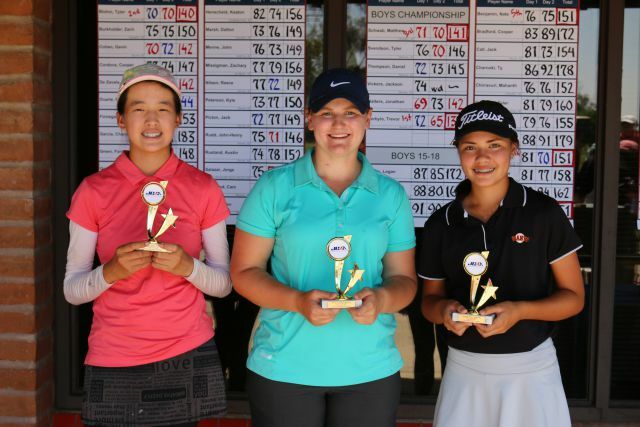 Menne continues to dominate the JGAA’s Girls Championship Division with her sixth win of the season at the Tucson City Junior Championship. She was the only player in the field, boy or girl, to card both rounds in the 60s (68-65—133, 7-under par). She finished three strokes clear of the hard-charging Jessica Williams who fired an incredible 62 in the second round (74-62—136). 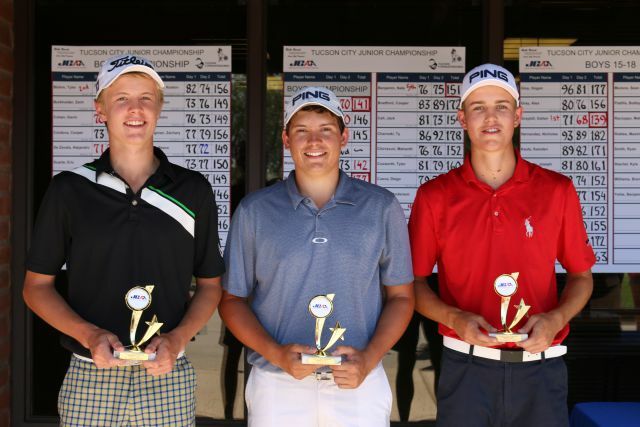 The tournament featured 175 Arizona junior golfers (boys and girls) ages 8-18 competing in five age groups. Dallan Graybill of Tucson won in the Boys 15-18 Division, whileDana Nussberger of Tucson won in the Girls 15-18 Division. Colin Alexander of Tucson won in the Boys 13-14 Division, and Katie Stinchcomb of Cave Creek won in the Girls 13-14 Division. Carlos Astiazaran of Tucson won the Boys 11-12 Division, while Hannah Ports of Oro Valley took the Girls 11-12 Division. Vincent Cervantes of Chandler won the Boys 10 and Under Division, and Lucy Newell of Oro Valley won in the Girls 10 and Under Division. This award is established in the memory of Michael J. Harris and is awarded to the player who demonstrates the qualities he lived by. Michael was a Tucson Conquistadores for 33 years and lived by their mission statement of being dedicated to continue the tradition of golf in Tucson and to promote and athletics. He lived his life as he played golf, with honesty, loyalty, good sportsmanship, integrity, respect, confidence, responsibility, perseverance and courtesy. He loved to play golf for the friendships developed on the course and the positive competitive spirit that comes with the game. He loved his community of Tucson, the people who lived here and he worked on many causes to make it a better place for all to live. Professionally he worked in administration at the University of Arizona, was the administrator of a local hospital for 14 years, the CEO of a health care network and a realtor. His real passion, though, was his family, philanthropy and golf. He was founder or chairman of over 30 community organizations including, but not limited to, the United Way, Rotary, Davis-Monthan 50 (DM50) and the Tucson Airport Authority. Since its inception in 1962, the Tucson Conquistadores civic group has raised $29 million for young athletes. The group has an active membership of 200 business and professional men who represent a cross-section of the Tucson community. Professional golf has been the primary source for the Conquistadores’ fundraising success. The Conquistadores currently sponsor the Tucson Conquistadores Classic, an Official PGA TOUR Champions Tour event staged in March. Proceeds benefit The First Tee of Tucson, Boys and Girls Clubs, YMCA, Pima County Special Olympics, the JGAA and dozens of youth sports teams and events throughout Southern Arizona. To learn more about the Tucson Conquistadores, visit www.TucsonConquistadores.com or call 520.571.0400.